A man died after ignoring advice given to people with new tattoos to wait two weeks before going swimming. The unnamed 31-year-old suffered septic shock and cellulitis - an infection of the deeper layers of skin and the underlying tissue - after swimming in the sea in the Gulf of Mexico. Expert advice normally given to people with new inkings says they should wait at least a fortnight before submerging them in pools or seawater. 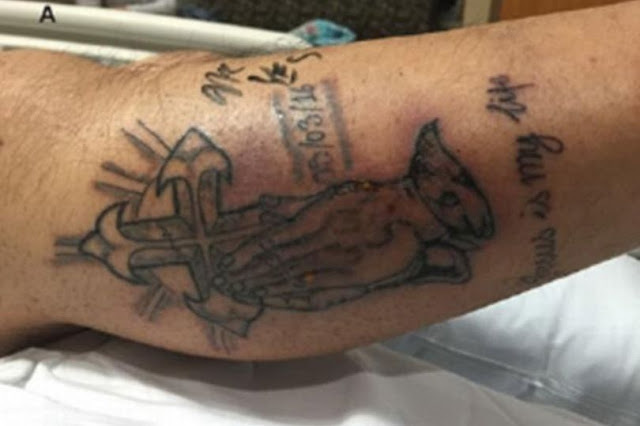 But the man reportedly swam in the sea just five days after getting a cross tattooed on his right calf, resulting in infection and septic shock which led to his death. His fresh wound became infected with flesh-eating bacteria and he developed a fever and serious rash surrounding his tattoo, the Daily Mail reports. When his condition deteriorated two days later, he was sent to hospital where doctors saw patches on his leg had turned a bruised purple colour. Medics immediately suspected the Vibrio vulnificus infection - which he was at a higher risk of due to suffering from a chronic liver disease. His drinking habits are believed to have weakened his liver, causing him to be more vulnerable to infections due to a decreased number of white blood cells that help fight bugs. Reports say the man's organs began to fail within 24 hours and he was placed on a life support machine. He then remained stable for a couple of weeks before suffering septic shock, and his kidneys failed completely. Sadly the man died two months after his admission into hospital. The BMJ report which documented the tragic case said: "Despite aggressive initial treatment, the patient developed septic shock and died. "This case highlights the association of chronic liver disease and high mortality associated with infections of V. vulnificus . "Health providers should remain vigilant for V. vulnificus infections in patients with chronic liver disease and raw oyster ingestion or seawater exposure." According to the NHS, Septic shock is a life-threatening condition that happens when blood pressure drops to a dangerously low level after an infection. Septic shock can occur as a complication of sepsis , a serious condition that happens when the body's reaction to an infection damages its own tissues and organs.